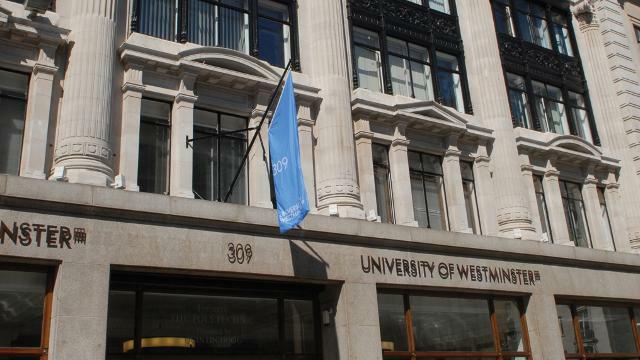 The University of Westminster has a world-class reputation that has been earned over a period of 175 years. Situated in central London, the university is within easy reach of the city's shops, nightlife, museums and businesses. The university’s reputation is built on exceptional academic quality, world-class research facilities and strong links with industry. Outstanding teaching staff place as much emphasis on gaining skills relevant to the workplace as on learning the academic discipline you are studying. Employers work with the university by offering placements and internships, as well as helping to deliver new courses and projects. Other courses have the endorsement of professional bodies, such as the British Psychological Society. The university offers world-class facilities including large libraries, state-of-the-art laboratories, studios, advanced IT services, sports and recreational facilities. With more than 5,000 overseas students from 150 countries, and an international focus to many programmes, the university reflects London’s cosmopolitan environment while providing a truly British experience. International student advisers offer a range of support services, from counselling to immigration advice. You can take pre-sessional English courses to help you develop the language skills necessary for academic life. You can also enjoy English language support during your studies that will help you with essay writing, reading and presentation skills. Industry relevant courses will help provide you with the skills and experience you need to succeed in a global economy. The Students' Union runs a huge number of clubs and societies, from the African and Caribbean Society to the Arab Society. There's also a drama society, a comedy society and a musical theatre group. Sporting clubs include American football, belly dancing, boxing, capoeira, cheerleading, Brazilian jujitsu, rock climbing and much more. The university offers scholarships to international students. "The University of Westminster may undoubtedly be called a dream university for international students. Not only does it provide a top-notch education in a country with centuries-old academic traditions, it is also conveniently located in the heart of London with immediate access to its numerous places of interest, and boasts of a variety of generous scholarships to give a lift to the students who are in need. Teaching staff are professional and friendly and are always there to help a student, be it a struggle with finding a research topic or simply directions to a canteen." Four main campuses, three in central London and one in Harrow, west of London. Founded in 1838 as the Royal Polytechnic Institution, it is one of Britain's oldest higher education institutions. Notable alumni include Burberry's creative director Christopher Bailey and fashion designer Vivienne Westwood.